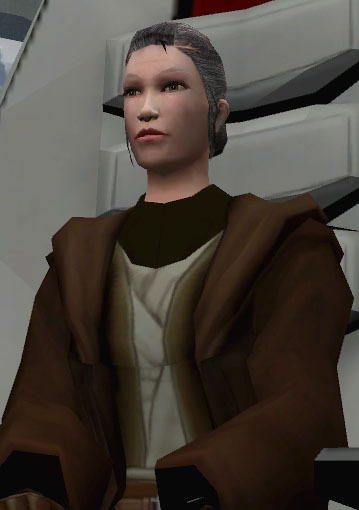 Lonna Vash was a Jedi Master and member of the Jedi Council during the Mandalorian Wars and the Jedi Civil War. She was one of the Masters who banished the Jedi Exile from the Jedi Order. Lonna Vash's role was bigger in the original vision of the developers, Obsidian Entertainment, but like many other incomplete things it had to be cut because of the forced premature release of the game. She was planned to be found by the player on M4-78, a planet populated by droids, where she came searching for the Exile with her Padawan, Kaah Ohtok. The corresponding conversation the Exile has with Vash was even recorded and put in the game file, but, like the incomplete planet, was never used in the actual game. However, as Vash was a Council member shown in an important cut scene, the developers placed her dead body on also-incomplete Korriban to explain what happened to her. Although it is never stated what kind of lightsaber Lonna Vash wielded, a lightsaber (the color and type of lightsaber are random) is found in the interrogation chamber. 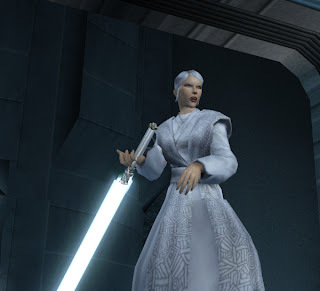 She is shown in cut content wielding a lightsaber with a silver blade, but as cut content is not officially canon, this has not been confirmed. By the time the Jedi withdrew from Taris, just prior to the Mandalorian invasion of the Galactic Republic, Vash had attained the rank of Master and gained a seat on the High Council. She stood in the chamber when Xamar, Raana Tey, Q'Anilia, Feln and Lucien Draay were relieved of their assignment at the Jedi Tower in the wake of the Padawan Massacre of Taris. After the war, she attended the trial of the Jedi Exile and decreed the former Revanchist was part of the Jedi Order no longer. Vash was among the Masters who convicted her the most, but she felt the Exile had changed since the end of the war, and she stood up to Atris after the Exile had left the Council chamber, when she said the wound the Exile carried was a sign of dark side corruption. During the First Jedi Purge, Atris called a conclave on Katarr aimed at finding the threat that stalked the Jedi. Neither Vash or Atris went to the meeting, but after the devastation of Katarr by the Dark Lord of the Sith Darth Nihilus, Vash and the surviving Masters went into self-imposed exile. Like her fellow Council members Kavar and Zez-Kai Ell, she probably thought that Atris had died on Katarr; she was in truth responsible for what had happened, as it was she who leaked knowledge of the conclave to draw out the Sith. On Kavar's suggestion, they traveled to different planets and hid their presence in the Force in hopes that the Sith would think themselves victorious and step from the shadows. They sought out places touched by war so as to be more difficult to detect, and because they thought there was a chance the Exile would return to such places, if only to try and make peace with what happened there during the war. Lonna Vash went to Korriban, to the abandoned Sith Academy. The Jedi Exile eventually arrived on Korriban during her search for the Jedi Masters. However, unbeknownst to her, the Sith Lord Darth Sion reached the planet before her; when the Exile entered the academy, the front door closed, trapping her inside. She found Master Vash lying dead in a pool of blood in the interrogation chamber—Sion had used Vash as bait for the Exile. Fortunately, the Exile found out that Vash, when still alive, had created a user account under her name in the academy's security system. This account would make it possible for her to open the front door and escape in case of danger. Using this account, the Exile fled from the academy after a short battle with Sion, whom she proved to be unable to kill.